Deeply discontented and disturbed by the state of the Union at the beginning of the second G.W. Bush term, veteran traveler and wilderness photographer, Tom Reed, sets out in search of a new home in South America, his imagined Paradise. He chooses Chile, a place he hopes is the Utopian opposite of his beloved California coast. Armed with a backpack full of hiking gear, a sharp eye, a bold pen, and an iPod that plays an inspiring soundtrack, Reed explores the wild landscapes, diverse people and fascinating cultures of southern Chile and Argentina while embarking on an unflinchingly honest journey to examine his own beliefs, yearnings, and experience. His wide-ranging odyssey takes him on buses, boats and trails through cities and towns, remote villages and pristine forests, to mountain camps and surfers’ beaches, where love affairs and politics, philosophy and ecology, religion and lost cameras all merge into a life-changing, mind-altering adventure. From the summits of high Andean peaks to the depths of his most personal thoughts and spiritual ideals, Reed seeks to discover what it means to be at home in the world, and in your own skin. “Through provocative insights and observations, Tom Reed explores the ruggedly beautiful landscape of Southern Chile and Argentina as intensely as he examines the current social, political, and cultural landscapes of North America and his own rich inner and spiritual life. Deeply personal, intellectually astute, and searingly honest, Reed misses no nuance in his inward and outward search for a place he can truly call home. 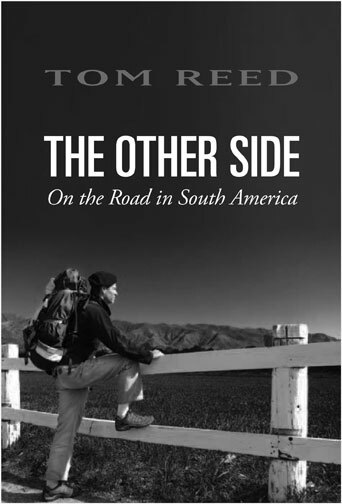 “Tom Reed is a born traveler and a writer’s writer, who makes you his intimate traveling companion, on this, his personal quest for a new home in South America. Along the way, you’ll be witness to his adventures and his catastrophes; you’ll measure your steps in time to his, sharing moments of ecstasy and despair, probably breathless to keep up, but glad you finally did. His conclusions, based on a combination of his political, cultural, and environmental insights, his own spiritual awareness, and this travel experience prove deeply satisfying. Whether you are an outdoor adventurer, an armchair traveler, or a dissatisfied norteamericano just looking for a better landing place, you’ll find your journey to THE OTHER SIDE one worth taking, perhaps even unforgettable.